“Leisure India Holidays” shares great bond with B2B travel agents to thrive together in Indian travel industry with a goal of sincerely showcasing the charms of India to its guests. We believe B2B agents are our utmost supporters, so do we are for them. 1. 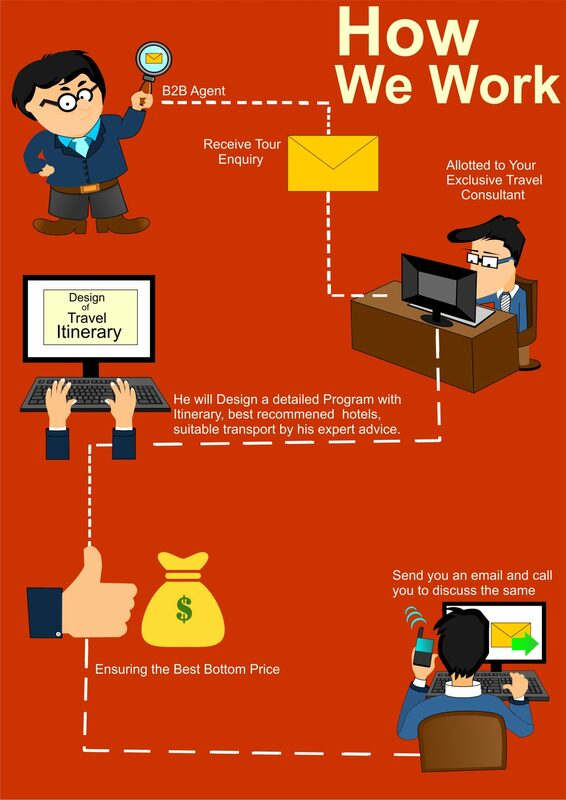 The moment we receive ” Tour Enquiry” on the behalf of B2B travel agent, we allot the same to our expert and “Best Travel Consultant” selected as per the destinations and activities demanded in tour. 2. Our trained travel consultant will research on the query to design the suitable tour with desired travel itinerary, best recommended hotels, easy transports and other facilities, suiting the needs and wants of guests. 3. After drafting the tour programs, our travel consultant will send you “Detailed Travel Itinerary” with “Best Possible Package Rates” of proposed hotels, transports and all other overheads. • Reserving appropriate and required transports. • Appointing best industry and reliable drivers. • Hiring registered and knowledgeable guides for sightseeing. • Recommending and Arranging special tour activities. 5. Once all the services booked, we send you the “Detailed Tour Package Confirmation” and our follow up, to receive the flight details from you in order to organize smooth arrival and departure of guests. 6. 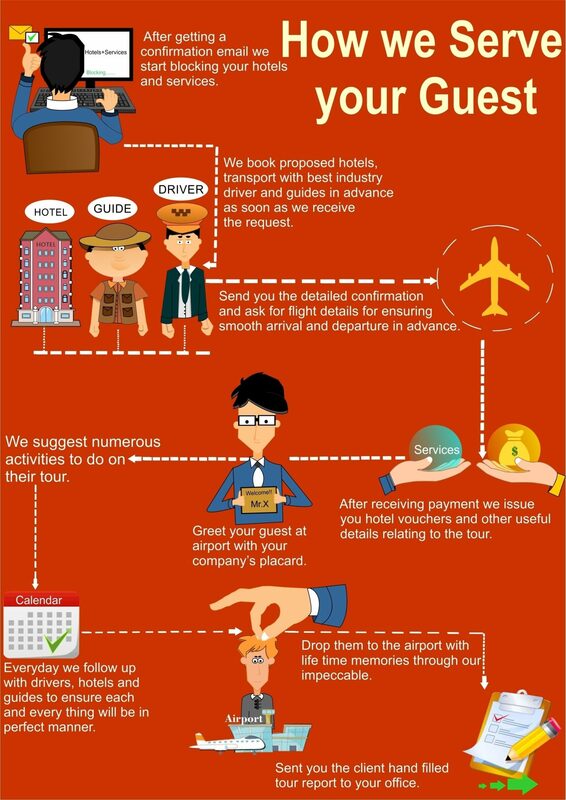 On acceptance of payment, we issue you “Hotel Vouchers” and other useful and required details relating to the tour. 7. We greet your guests at airport with “Your Company’s Placard”, warmth, comfort and our safety measures. 8. Every day we catch follow ups with drivers, hotels and guides to ensure each and everything is going smoothly and flawlessly as per the planned tour. 9. Finally we drop the happy and satisfied guests to the airport for departure with sweet memories. 10. Last but not least, We send you the guest’s hand filled tour report to your office. As a leading travel company and principal travel agent, we have direct relationships and specially contracted rates with all leading hotels and this again enables us to save you any unnecessary commissions charged by middlemen. 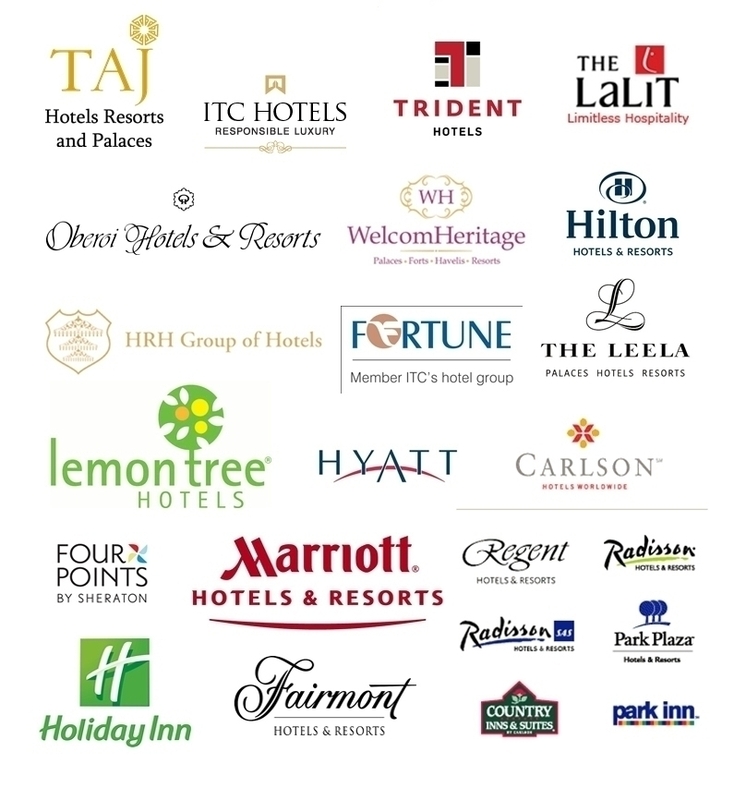 We enjoy the best hotel rates in the industry due to our preferred partner status. Why we make a difference? • We believe in ensuring industry’s best bottom price for all facilities we provide while maintaining the supreme quality. • We suggest the guests numerous activities to pursue on their tour to get the best and unique from their tour. • We work with a motto of preserving trust and harmony with our supporters – the B2B agents. • We are most excellent in developing coordination with you to increase more and more happy guests in our travel business journey.